Do you ever feel like you complain too much? The last few months have been a bit bumpy for me health-wise since my diagnosis of gallstones. I haven't been able to eat whatever I want and while I'm scheduled in to see a surgeon to have my gallbladder removed, my appointment is still a month off, and then I have to book a surgery after that with a 4 month wait time. My goodness, my life is so hard. The first month or so of my gallbladder fiasco saw me very bitter about my situation. I was bitter about the fact that I wouldn't be able to eat another steak or ice cream cone or ear of corn for the rest of the summer. I resented the number of salads I was forced to eat and had a hard time eating anywhere other than at home. It wasn't fun anymore. As I implied above, however, a month in and my attitude started to change. First of all, I told mysef to stop wallowing in self-pity and to get over myself, and that's about when I realized with all my grumbling to God, I forgot to thank Him for the experience. I'm eating healthier than most people could dream of doing out of sheer necessity, and I've been getting alot healthier myself because of this. I had wanted to lose weight after I gave birth to my second son 3 months ago, and I certainly have been able to do that now. I'm researching healthy options and recipes which I never bothered looking into before, and which will be incorporated into our regular meal rotation even after this is all over. My family is eating more veggies, less bad fats and being more aware in general of what we eat. My family and I will, in all likelihood, be healthier for the rest of our lives because of this. However, it seemed like once I had finished complaining about something, I couldn't go without finding a new grievance to whine over, and this time I landed on the wait time until I can have my surgery. It will have been about a 3 month wait time between making my appointment with my surgeon and when I actually get in to see him. Then it will probably be another 4 months before my scheduled surgery time rolls around. My first reaction was, "This is ridiculous." Then, last week, I was at a monthly Pampered Chef meeting when my director (my go-to lady) informed us that she was awaiting the results of a biopsy, and they didn't have much reason to believe it would come back negative. Sure enough, the very next day she got back her test results which confirmed she had breast cancer. Since then, she has kept us in the loop regarding her treatment. She made an appointment last week with her surgeon and will be seeing him today, and hopefully will be receiving surgery within a couple of weeks. This is why I wait months to see my surgeon: so that people with real issues, like aggressive cancer, or organ failure, or one of the multitude of other conditions and afflictions which are life-threatening, can get the care they need to survive. My condition is an inconvenience: it hurts if I eat certain foods, so I don't eat those foods. Easy. But if my 7 month delay between diagnosis and surgery means that a wonderful lady, who is a wife and the mother of 2 teenagers, can get the time-sensitive care she requires, then I would gladly trade my 7 months of inconvenience for 7 years. Ironically, October is Breast Cancer Awareness month, and I assure you, most people from my Pampered Chef team are more aware of it than ever because of our director's recent diagnosis. Pampered Chef is trying to do it's part in October by making this the Help Whip Cancer month. PC has released a line of limited edition pink items, from which $1 of each purchase will go directly to the Canadian Cancer Society. 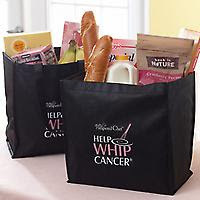 My focus is currently on one of the items: a 2-pack of reusable shopping bags with the Help Whip Cancer logo for $3.50. I will be placing a mass order of these at the end of the month and would invite everyone to order a set, or more. I'll cover the shipping and tax, but I would like everyone to spread the word, even if you can't get any yourself at the moment. I've challenged my whole team to do the same offer with all of their friends, family and acquaintances in honor of our director. I wan to see just how much money we can raise for cancer research in the course of a month. So please, let me know if you want to Help Whip Cancer.